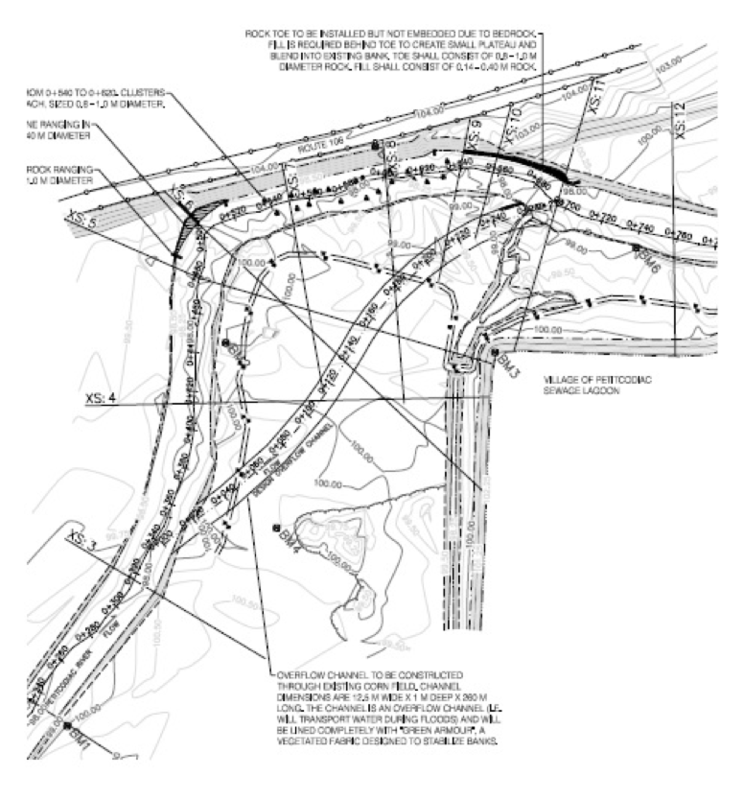 If fish passage is a priority, the culvert under Route 126 is an issue with the downstream invert hanging above the streambed. The culvert appears to be able to handle the flows as the oxidization line on the pipe is approximately a third of the way up from the bottom (Figure 4-7). It is also noted that looking though the culvert, based on the photograph, the pipe may be collapsing. However, this could simply be the angle the photograph was taken and further investigation may be warranted. As with any increase in sediment load to a watercourse the source needs to be determined prior to implementing any instream restoration structures. Otherwise there is an inherent risk that the instream structures will be buried. Once the source or cause of the excess sediment in the system has been determined proper restoration or mitigation measures can be taken to assist with the natural movement of the material through the reach. By creating deposition or scour areas, equilibrium of sediment load through the system can be achieved ensuring that any instream habitat structures function as intended. Restoration efforts, whether for instream habitat or bank erosion, therefore need to consider what the end goal of the restoration is and the effects that will result from implementing such measures on upstream and downstream banks and instream features. Channel restoration efforts in Reach 3 should be designed to narrow the channel by accumulating sediments towards the banks. Accumulated sediments would develop lateral bars that would naturally narrow the channel. It should be noted that any design structures intended for improving instream habitat should also be constructed to assist in narrowing channel width and not create scour along the banks. Bank restoration efforts in Reach 3 need to be designed to narrow the channel to a more natural width but able to handle varying discharges without creating erosion issues. The designs need to incorporate floodplain access, particularly where the channel has degraded or widened beyond the natural bankfull discharge width/depth. Bank or aquatic habitat restoration efforts should ensure that designs implemented do not increase sediment loads where there is already aggradation occurring or decrease sediment loads in areas where there is already degradation of the channel occurring. As sub-reach 3‐1 begins to the west of Morton Road (the downstream side of the bridge) further investigation should be given to determine the reason for channel degradation in these sub-reaches. One possible issue may be with the bridge constricting flow during higher discharge events. However, flow capacity through the bridge would need to be modeled to determine if there is any channel constriction occurring from this structure. Before any restoration efforts begin in Reach 5, the source of the additional sedimentation to the streambed needs to be determined. Once the root source and cause of the sediment has been identified, channel restoration and/or bank restoration designs need to bring the channel into a state of stability through equalizing the sediment movement in this reach. In other words, the amount of sediment coming into Reach 5 should match the sediment load moving out of it. Restoration efforts within these sub‐reaches should first focus on identifying where the additional sediment load is originating. Any instream habitat restoration completed prior to locating the source or reason for the aggradation of the streambed will jeopardize the longevity of the work. If efforts to control or at least identify the source of streambed aggradation are not part of the overall restoration plans for Reach 6, eventually structures to improve instream habitat will most likely be buried through these sub‐reaches. Restoration efforts, whether it is instream habitat, bank stabilization, or floodplain creation, in sub‐reaches 2‐28 to 2‐38, should be attempted with caution. Determining bankfull discharge rates and depth/width ratios will be an important factor in any channel or floodplain restoration modifications through these lower sub‐reaches of Reach 6. To date, the culvert, identified as WM20, located under a two lane asphalt road on Route 126 at Control Section #R0126 009-9.550 was indicated as being as in fair to poor condition. Not surprisingly, this is the culvert identified in the 2012 surveys from Reach 1. The Petitcodiac Watershed Alliance and the Village of Petitcodiac have been examining options for a bank stabilization project protecting civic infrastructure in the form of Route 106 on the left side of the river and the Village sewage lagoon on the right side of the river. The location is actually 1.8 kilometers downstream of the confluence of the North and the Anagance Rivers and so is technically on the main stem of the Petitcodiac, not the North River. Though not within the North River watershed, given that the site is located immediately downstream, essentially all of the First Level historical, and Second Level current impact assessment data for the North River remain applicable, and as such provide relevant context for the project. The involvement of the Village of Petitcodiac as a stakeholder is another reason to include it here both because the relatively high profile of the project impacts the awareness of individuals a short distance upstream along the North River, and the outcome of this project will influence any future collaborative activity with the Village of Petitcodiac on the North River itself. In 2014 the Petitcodiac Watershed Alliance and the Village of Petitcodiac contracted with Parish Geomorphic Ltd. to evaluate the identified threats to infrastructure and develop recommendations for an intervention to solve it. The results of their analysis are presented in Figure 4-25. The proposed plan involves two options. The first (less expensive) option, calls for installation of rock spurs and boulder clusters along the toe of the slope below Route 106. 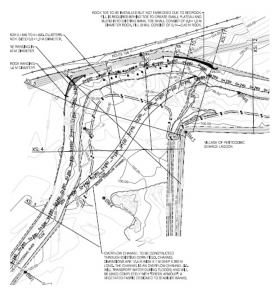 The second (more expensive) option involves creation of an overflow channel running between the sewage lagoon and the existing main channel in order to shift stormflow away from Route 106, but do so in a regulated manner that preserves the sewage lagoon. In 2015 the first option will be implemented by The Petitcodiac Watershed Alliance as the project lead, in collaboration with Parish Geomorphic Ltd. Fort Folly Habitat Recovery will be involved in the project by accessing funds to help support it through the Habitat Stewardship Program. 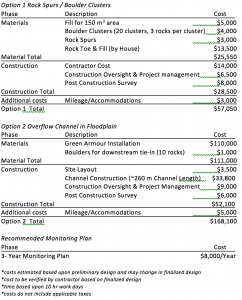 It is not yet clear when or if the second option (the overflow channel) will be implemented, though it seems quite possible that, even if the initial effort focuses on only the first option, the second may eventually become necessary in order to fully address the issues at the site, and provide adequate protection for the sewage lagoon. 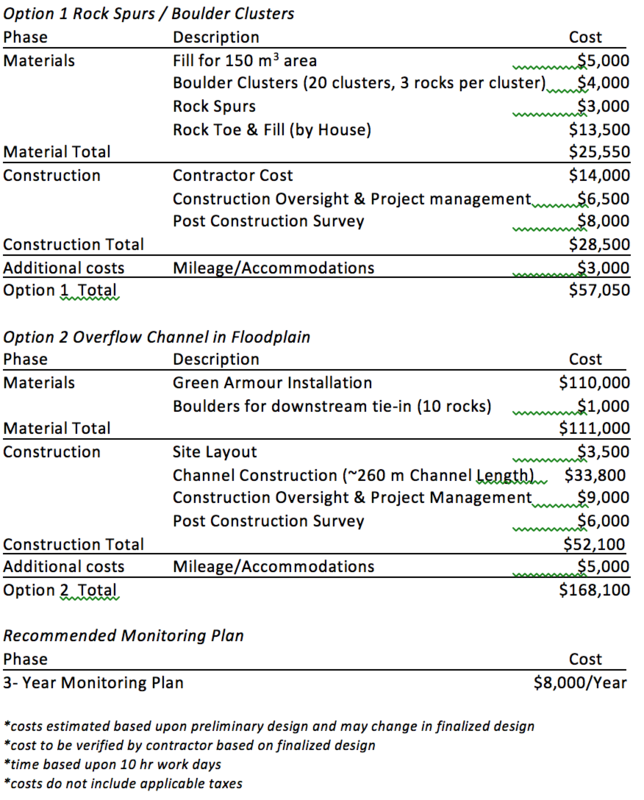 Table 4-3 lists estimates provided by Parish Geomorphic of the costs and requirements of each option. Other possible restoration activities within the North River Watershed are described below; targeted artificial debris removal, and culvert replacement. We do not anticipate any negative effects to the target species or their respective habitats. All of the prospective activities would improve the quality of the aquatic habitat for American Eel, Atlantic salmon and wood turtle. The removal of artificial instream debris could improve the water quality of the surrounding habitat by removing possible contaminants. It could also help prevent bank erosion depending on the location of the debris and help restore fish passage where debris is prohibitive of movement. Culvert replacement could help restore passage in areas where it is currently blocked by faulty infrastructure. Restoring passage will be most beneficial to iBoF salmon as they are the least able of the three target species to navigate past barriers. American eels and wood turtles are both capable and known to cross barriers via terrestrial terrain to navigate around barriers.